When you think of spacefaring nations, Israel probably does not come to mind. So when it was announced that the 2015 International Aeronautical Congress (IAC) would be held in Jerusalem, many in the space community scrambled to figure out exactly what this diminutive country has to offer the space community. After attending IAC in October, it is clear that the Israeli aerospace community is a lively and growing marketplace with decades of experience and great potential for growth. Israel became just the 8th country to launch a spacecraft with its 1988 launch of OFEQ 1, the first in a series of surveillance satellites developed by government-owned corporation Israel Aerospace Industries (IAI). Israel’s launch vehicle is the Shavit, a three or four stage launcher with payload capacity of 350 kg. Shavit launches into a highly unusual retrograde orbit. As with many elements of Israeli life, retrograde launch is necessitated by the nation’s geographical and security realities: the only direction in which Israel can launch without overflying populated areas or hostile nations is west, over the Mediterranean Sea. This reality has placed constraints on Israel’s ability to launch high mass payloads, so the nation has become something of an expert in low mass designs and miniaturization, two specialties that are in high demand in today’s nanosatellite era. In 2013, Israel decided to place new focus on civilian space missions with a dramatic increase in funding to the civilian Israel Space Agency (ISA) from the equivalent of a few million US dollars up to $48 million. The agency quickly put those dollars to work in the form of collaborative Earth observation missions including VENμS, a vegetation monitoring satellite jointly developed with CNES; SHALOM, a hyperspectral satellite developed with ASI; and SAMSON, a formation-flying nanosatellite experiment. ISA also supports the non-governmental SpaceIL organization which recently became the first Google Lunar XPrize team to produce a verified launch contract and participates in ESA’s JUICE Jupiter mission. 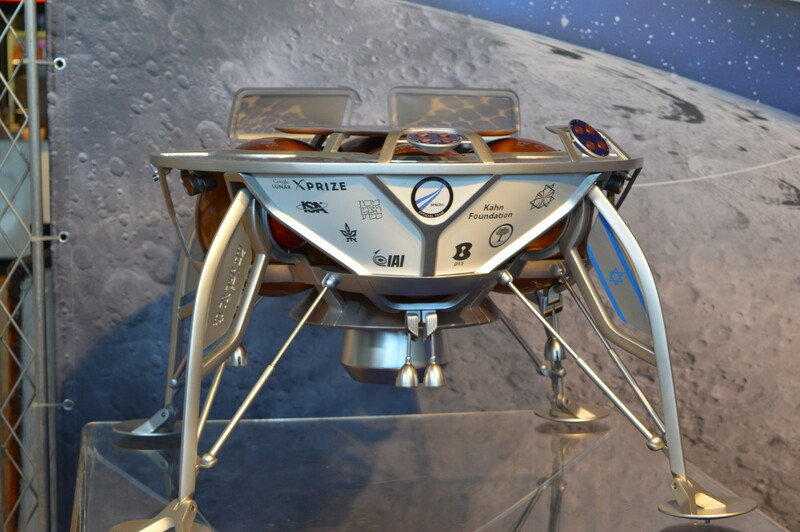 A mockup of SpaceIL’s lunar lander on display at IAC2015 (Credits: Merryl Azriel). Israel Aerospace Industries (IAI) is a government-owned corporation and Israel’s prime contractor for both military and civilian aerospace and aviation. IAI manufactures the Amos communication, Ofeq surveillance, and Eros observation satellite series as well as the Shavit launch vehicle. RAFAEL is primarily a military contractor but provides propulsion and reaction control systems for civilian satellites as well. Elbit Systems provides electro-optics and satellite communication platforms. Spacecom operates the AMOS communication satellite fleet. Gilat Satcom operates a VSAT network across the Middle East and provides satellite internet service using AMOS. SpaceIL is an Israeli team competing in the Google Lunar XPrize competition. One of 16 remaining teams, SpaceIL recently became the first to secure a launch vehicle for their lunar probe. SpacePharma designs miniature lab modules for conducting remote chemical and biological experiments on nanosatellites in microgravity. Their mission is to make it cheaper, easier, and faster to field a microgravity experiment by bypassing the International Space Station. 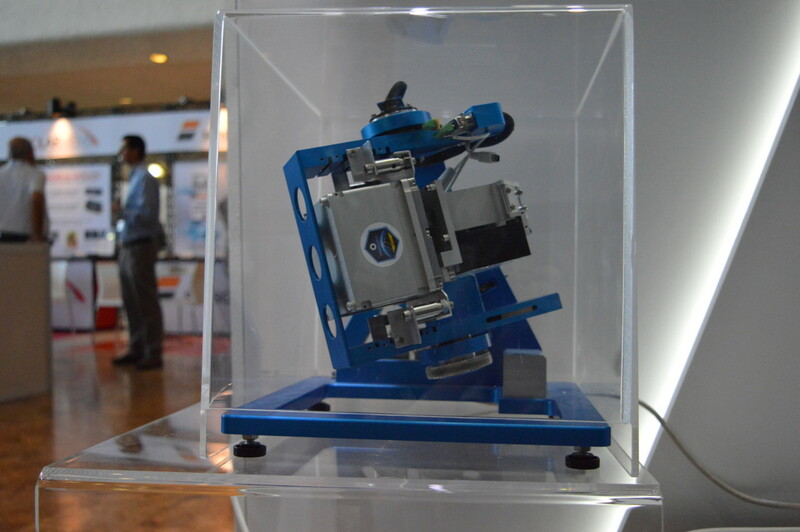 SpacePharma’s custom designed lab module on display at IAC2015 (Credits: Merryl Azriel). I sat down with ISA’s Chairman, Major General (Ret.) Prof. Isaac Ben-Israel, to talk about the significance of hosting IAC in Jerusalem, the nature of technological solutions to political problems, and Israel’s future in crewed spaceflight. 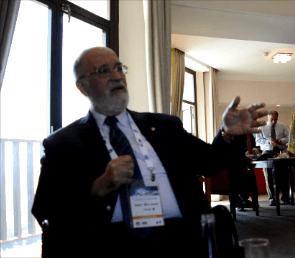 Israel Space Agency Chairman Prof. Isaac Ben-Israel Credits: Merryl Azriel). The ability to bring together space actors produced some immediate results, with new agreements launched between Israel Space Agency and NASA, CNES, and ASI, all announced during the IAC convention. But beyond local interests, Ben-Israel highlighted the role of international collaboration throughout the space world. One area where international elements are helping solve technological problems is in Tallinn, Estonia, commonly recognized as the first target of a cyberwarfare attack. As a result, Estonia became a leader in cyber security technology and paved the way for its namesake, the Tallinn Manual. “It’s [an] informal manual,” says Ben-Israel, “not accepted as guide formally by any country, but it is a good one. A lot of experts coming from different countries every year, trying to determine international norms, standards, code of behavior, and things like this.” While talks at COPUOUS on an international code of conduct move haltingly forward, the Tallinn Manual and the process of annual discussions around it provide a means for practitioners to secure space assets from at least one type of hazard. “I bought a new refrigerator, two weeks ago, a normal, Korean LG refrigerator. In case of some malfunction, the technician told my wife, take your iPhone, you put it close to this black dot. The refrigerator will use your phone automatically to send to the maintenance center some 20 miles from my house the details of the problem. The technician will come with the right spare parts.” While such technology delivers convenience and efficiency, it also introduces ever more opportunities for infiltrators. “We don’t realize usually that by this we become dependent on those machines and it creates a weak point. Someone can use this dependence in order to cause damage, some bad guys. Living in Israel, in Jerusalem, I can tell you there will always be bad guys. And one day, one of them will think about the possibility and try to use this highly connected network of computers for shutting off the electricity, for disabling satellites. “It’s very easy, very easy to hack into all these chips and to cause damage. Unless you protect it. People say cyber space because it’s a new dimension so they would like to say where it is, this damage, so: cyber space. But really there is a connection between space and cyber security. “On the opening day [of IAC], we had a panel of heads of agencies. They asked what would happen in 2030. I said in 2030 there will be still a convention like this with heads of space agencies speaking about space. I hope it will be possible in 2030 – and it will not be possible if we will not take care of this cyber threat.